Nu jäklar…nu tar vi SVERIGES RADIO med storm! Intervju om ART MONSTERS OF SWEDEN -podden och kollektivet på P2 Sisuradio idag kl 13:45. Nu finns ART MONSTERS OF SWEDEN-podden som länk i menyn här på sidan. 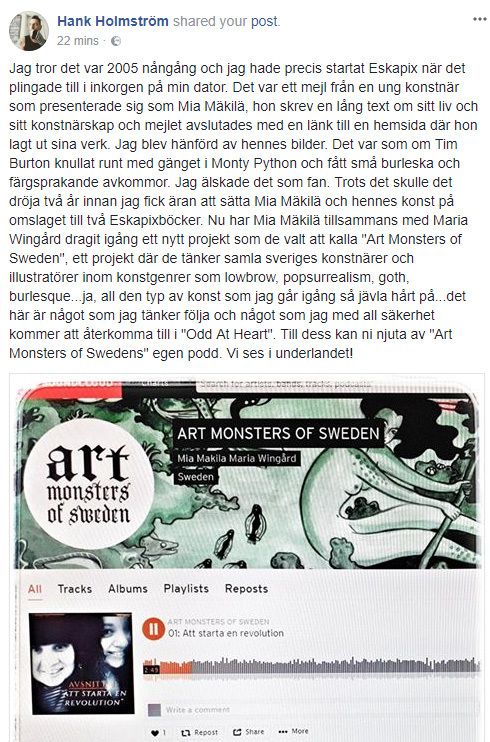 Maria och jag har blivit två “art warriors” i och med att vi är teamet bakom ART MONSTERS OF SWEDEN. 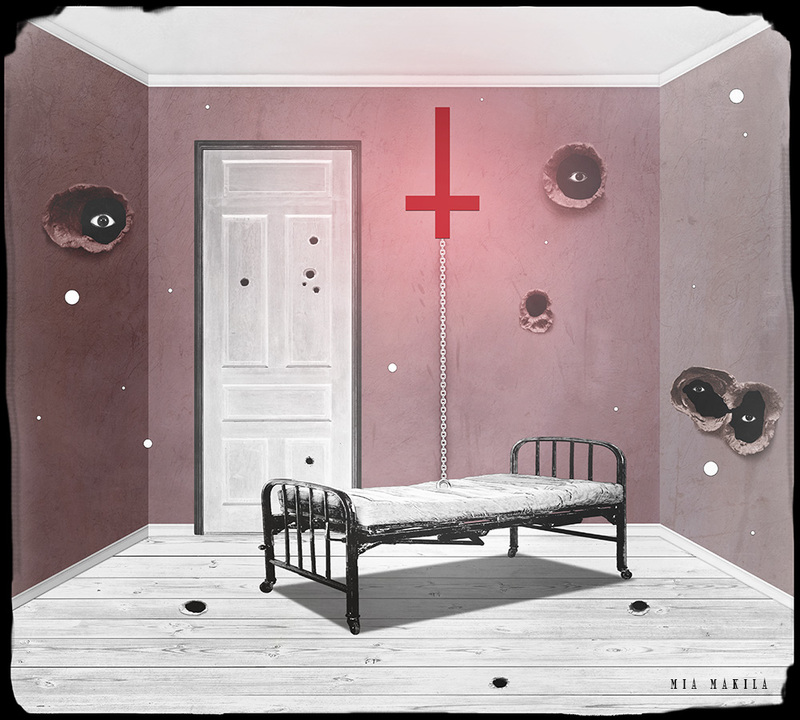 Vi har byggt en poddstudio i min pytte-garderob där vi sitter och filosoferar i podden och uttrycker vår ambition och passion om att leda den svenska lowbrow-och dark art rörelsen framåt – och även om vi båda är neurotiska och ängsliga som två små darriga löv, känner vi oss starkare i oss själva än någonsin och känner oss HELT självsäkra i vad vi vill uppnå med ART MONSTERS. Jag är stolt över oss. På två månader har vi lyckats få ihop 40 av Sveriges främsta Lowbrow och dark art konstnärer och försökt få dem att känna sig trygga och peppade på att göra den här resan med oss, vi har nu nästan 2000 följare på Instagram, vi har lärt oss redigera videos, startat en podd och lärt oss klippa ljudfiler, arbetat fram en unik logga (som snart är klar), byggt coola samarbeten – allt detta medan vi har jobb vid sidan av och andra åtaganden. MEN FRÄMST är jag stolt över att vi lyckats hitta det där äkta finska sisu som rinner i våra ådror. Sisut kommer driva vårt skepp i hamn. Vi. Kommer. Aldrig. Ge. Oss. Maria och jag pratar om en återkommande mardröm där jag gör mina behov offentligt och hur det relaterar till att vara konstnär. Klicka på videons volym för ljud. 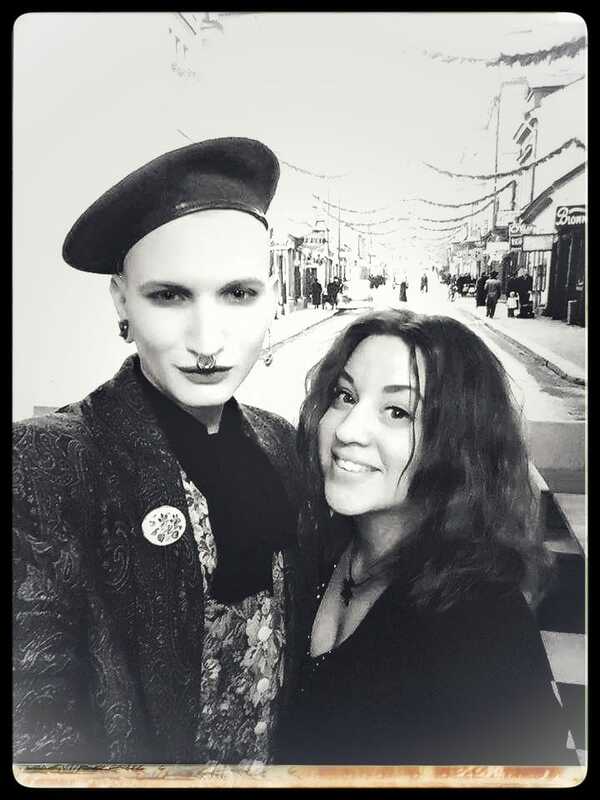 I’m so grateful for being alive on this planet just so I can connect with beautiful and like minded souls. I shared part of my birthday tonight with ART MONSTER member Tommy Liddell who made it magical just by being who he is. I am proud of our collective and I know that this is the beginning of something really big and wonderful. 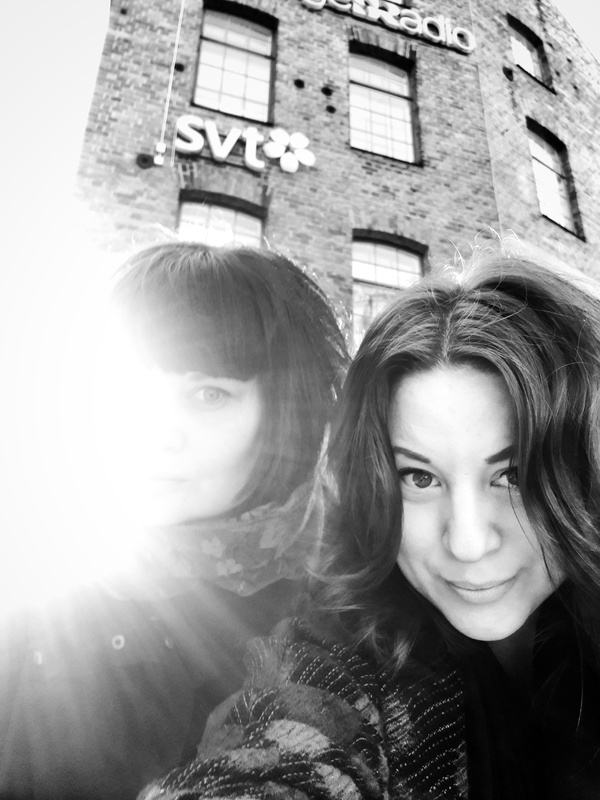 We are working around the clock to keep up with the ART MONSTERS OF SWEDEN project. We are currently designing a new logo and planning new episodes of our podcast! Next episode will go live later today. Wow! Look at this! @kurewnamimi designed this cool make up, inspired by my (2009) painting “Scrollan”! I love it! Even though I am stuck in bed with a cold, my art has a life of its own. 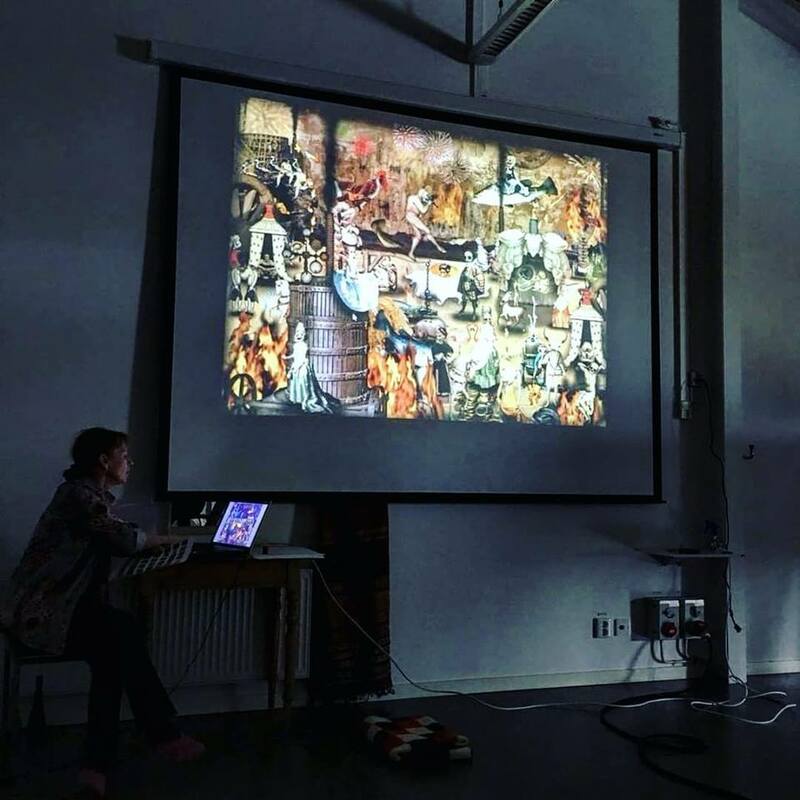 An art student from Önnestad art school (Sweden) just sent me this picture: “You and your art showed up at today’s lecture”! I feel so honored – and I hope the students felt really inspired! Vad säger man om en sådan här presentation om min konst och om ART MONSTERS OF SWEDEN? Underbart! Tack Hank Holmström (Eskapix)! I am slowly getting relaxed and comfortable with the hard work I have to put into the ART MONSTERS project. I don’t feel stressed anymore, just happy and excited. We have gone from 10 members to 30 in just 2,5 weeks! It’s incredible. Many things are happening and processes are in motion; we are creating a logo, building a website, starting a podcast (I will link to it here as well) and looking into the possibilities of starting our own gallery. The only obstacle is our (substantial) lack of money – but nothing can stop this ‘Mama Monster’ from starting a new art movement in Sweden! 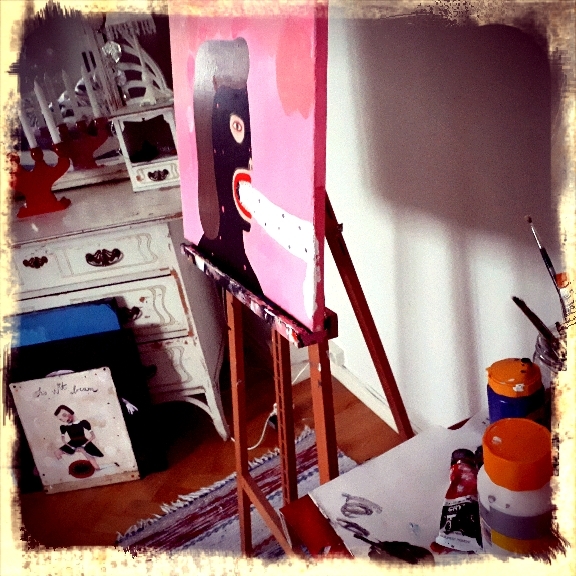 I have been working on a few old and unfinished paintings and it is finally becoming fun to paint again. It is like I was used to being deflated but now I am finding my substance again. And even though I don’t have any time to do much else than work, work and work – I feel happier than I have ever felt in my life. The only thing I miss is the freedom of having time to write. Me and Maria at work. 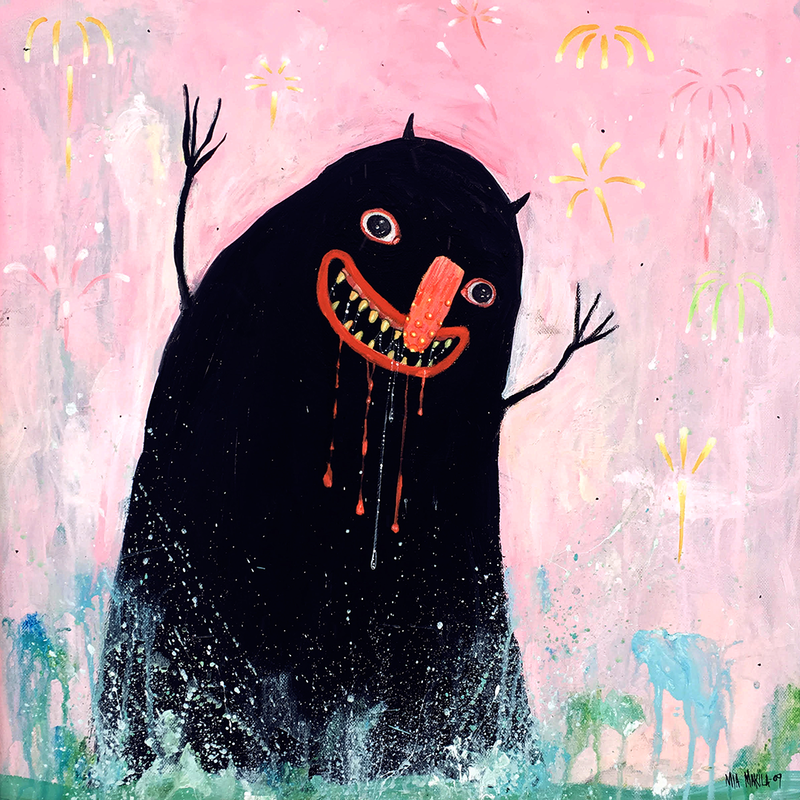 It’s only been a week since we launched the ART MONSTERS OF SWEDEN collective and the response has been mind-blowing! So many Swedish artists have approached us and expressed their gratitude and wish to join our group. In just one week we got 228 followers on Instagram and 261 likes on Facebook. That’s pretty great. I feel so happy and excited, because I know now how important and desired this initiative really is – not only by me and Maria – but by so many other artists out there. I have a list of 23 artists so far and I know that there will be many more to come. This project has become its own entity – it is alive and growing bigger all the time. Maria and I are searching for galleries, spaces, financial support and we are trying to set up a business strategy for our concept. The ART MONSTER initiative is a doorway to so many new adventures for us. And we are having so much fun with all this! I used to look for the perfect ‘playmate’ in a romantic partner. Someone to make projects with, a muse who would inspire me to just do/make/be – everything and anything I wished to do/make/be. Now I know that I have found that person, but not in a lover but in a friend and someone to share my artist dream with. Because we generate so much happiness in each other, I have found courage to go back to painting again. I have about 8 paintings from 2015-2018 and it’s time for me to start building a new collection around those. I don’t have any old paintings left, I have been sold out since 2012. That’s crazy. I think this is the perfect time to start something new – and bold – and absolutely amazing! Even though I have been sick for a few days, I feel so happy! This project is growing bigger and stronger every day! I’ve had this idea of starting an art revolution in Sweden for over 10 years and now it is finally happening. Together with Maria and the group, I feel invincible! Right now, I don’t have any free time, I work all possible hours of the day. I am tired and my health is a bit weak but I feel like this is something that I just have to do. It is always painful and uncomfortable to give birth to a new life – may it be a baby or a small art revolution. 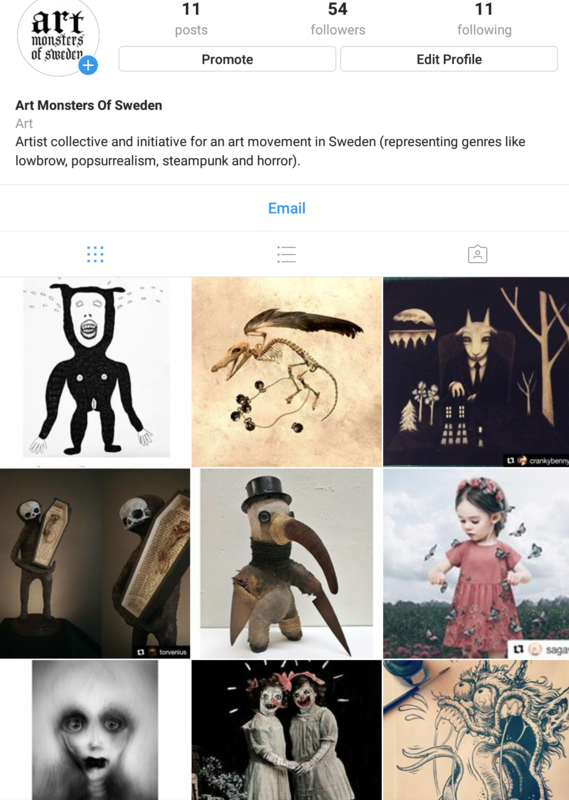 WE ARE THE ART MONSTERS OF SWEDEN – artist collective and initiative for a new art movement in Sweden (representing genres like lowbrow, popsurrealism, steampunk, goth, horror). To support us, please LIKE US ON FACEBOOK and FOLLOW US ON INSTAGRAM ( @artmonstersosweden )! “Panic Room” by Mia Makila, 2018 (digital collage). Click image to enlarge. First artwork of the year finished and the comeback collection completed! 4 years of hard work!